The sky isn't coloring blue as before as it was siezed by fading layer of smoke and dusts. Buses and trains are running with deserted seats . It looks like the city was just woke up from the nightmare. This is scene of early Wednesday morning 12/09/2001. At the same time in the morning of Tuesday, the city was started with the beautiful melodies and smiles. Sky-high buildings were proudly stands with the background of beautiful sky. The stream of various types of vehicle are flowing on the road.People were preparing to start a day as they have no idea what will happen in the next few hours. All the melodies and smiles were badly disrupted by devil's scream. The beautiful sky suddenly turned it's color into dark, several buildings and ground was shaken when the huge planes crashed into the 1 World Trade Center (North Tower), it's the time of 8:46 AM, September 11 2001. The 9/11, also known as September 11th was the series of attacks by Al-Qaeda upon the United States on September 11, 2001. Early morning of Tuesday September 11, 2001, 19 terrorists hijacked four airliners en route to San Francisco and Los Angeles from Boston, Newark and Washington Dulles International Airport, Washington D.C.
On that morning at 8:46 AM, American Airline Flight 11 was crashed into the North Tower of the WTC. Later at 9:03 AM, World Trade Center's South Tower was hit by United Airlines Flight 175. Pentagon was also hit at 9:37 AM by American Airlines Flight 77. Flight 93 or United Airlines which seemed to target the United States Capitol or White House, crashed near Shanksville, Pennsylvania at 10:03 AM, after the passengers tried to retake the aircraft from hijackers. According to United 93's blackbox recordings, the crew and passengers tried to take control of the plane after learning about the crashings through the phone calls. Soon after, the plane was crashed into a field near Shanksville in Stonycreek Township, Somerset County, Pennsylvania at 10:03:11 AM. Later in the interview with Yosri Fouda, an organiser of the attackes, mentioned the target of United 93 was the United State Capitol, code name "the Faculty of Law" as given. 7 World Trade Center(7 WTC). The build later collapsed in the evening at 5:20 PM. There were a total of 2,993 deaths including citizens from 19 hijackers, 246 on four planes, 2,603 in New York City in the towers and on the ground, and 125 at the Pentagon. Citizens from more than 99 countries were killed in the attacks. An additional 24 people listed as missing. All of deaths were cilivians except for 55 military personnel at the Pentagon. Estimated about 17,400 people were in the buildings at the time of attacks. The people below the impact zone safely evacuated the buildings, alongs with 18 peoples from south tower. At lease 200 people jumped from the burning towers to their deaths. 411 emergency forces were died as they attempted to rescue people and fight fires. 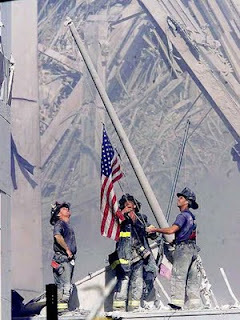 341 firefighters from FDNY (New York City Fire Department) and 2 FDNY paramedics. Private EMS units lost 8 EMTs (Emergency Medical Technician) and paramedics. An Investment bank, Cantor Fitzgarald L.P., on the 101-105 floors of the 1 World Trade Center lost 658 employees, more than any other employer. Marsh Inc., located on 93-101 (the location of Flight 11's impact), lost 355 employees and Aon Coporation lost 175 employess. Weeks after the attack, the estimated death toll rised over 6,000. The city was only able to identity remains about 1,600 of the victims at the World Trade Center. The medical examiner's office also collected "about 10,000 unidentified bone and tissue fragments that cannot be matched to the list of the dead". Bone fragments were still being found in 2006 as workers were preparing to demolish the Deutsche Bank Building, which was damaged by the collapse of 2 World Trade Center (South Tower) . 3 World Trade Center (Marriott World Trade Center), World Financial Center complex and St. Nicolas Greek Orthodox Church. The World Trade Center site, ground zero, was cleared by the end of May 2002. No Comment to " September 11 "